A paramedic with the Philadelphia Fire Department gave testimony today about his experience at Kermit Gosnell’s abortion clinic when he responded to a “Code Blue” call for help in November, 2009. A young paramedic named Smith told the court he was the first paramedic to arrive on the scene. He was taken through the maze of rooms and hallways to an abortion room where he found Karnamaya Mongar laying on an abortion table naked from the waist down with her legs still in the stirrups in full cardiac arrest. Smith said that Mongar had “flatlined” meaning there was no detectible electronic pulse in her heart. Gosnell was in the area but did not offer any help. An effort was made to get information about the drugs the patient was given, but that effort was unsuccessful. Smith, who testified he holds a two year Associates of Arts degree, was able to used emergency drugs, chest compressions, and eventually a defibrillator to get a heartbeat started after 15 to 20 minutes. He then asked one of the Firemen at the scene to find him a way out. Mongar had to be put on a Reeves Board because the gurney would not fit through the cramped hallways. Eventually she was extracted through the back door of the clinic, but not before employees ran through the office seeking a key to the lock. Smith testified that no clinic employee accompanied Mongar to the clinic and that no medical file or other paperwork that may have had useful medical information was transferred to the hospital with the patient. Mongar later died from what a toxicology witness said was an overdose of Demerol. Gosnell has been charged with third degree murder in her death. Elizabeth Hampton testified about her role at Gosnell’s clinic and about events on the night that Mongar died. Hampton is the foster sister of Gosnell’s wife, Pearl, who said she worked 12 hours a day, five days a week at the abortion clinic cleaning and answering phones where she was paid $10 an hour cash and a bonus of $20 for each second trimester abortion done during her work shift. An emotional Hampton testified tearfully that she worked on and off for Gosnell since 1999. She said she suffered from alcohol abuse and finally was able to get clean and sober in about 2006. 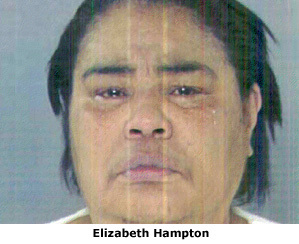 Weeping, Hampton told how she had quit working for Gosnell due to a dispute with him in 2006 after she saw something at the clinic she “could not go along with.” She was not allowed to describe the incident, however, she said it caused her to “fall off the wagon” and return to drinking for a time. Hampton also testified about her cleaning duties, which included the large bottle on the suction machine that would fill with blood and fetal remains during first trimester abortions. She testified that she would dump the blood contents of the bottle into a wash sink located between procedure rooms then turn on the garbage disposal – the same one present in the court room as evidence – and grind and flush the contents down the drain. It is illegal in Pennsylvania to dispose of bloody remains in this way. It was above that same wash sink that Crime Scene Unit Officer Taggart testified he discovered several jars containing the severed feet of aborted babies. On the afternoon when Mongar died, Hampton said that when she reported to work she was asked by another employee, Tina Baldwin, to administer Cytotec to Mongar so Baldwin could go home. Cytotec is a powerful uterine stimulant. Hampton said she found two pills in an unmarked envelope paper clipped to Mongar’s chart then located Mongar in the recovery room. Mongar was sitting in a recliner in a drugged stupor and was unable to take the medication herself. Hampton then placed a pill between each cheek and gum then left Mongar unattended. The dosage was twice the recommended amount. Some time later, Hampton noticed a commotion in the clinic as two other employees made multiple calls to 911 while running though the building pulling out drawers in search of the key to the back door – the only entrance that would accommodate a gurney. Hampton then went into the procedure room and saw Gosnell standing near Mongar just looking at her. He was not attempting to provide her any medical assistance. Gosnell then asked Hampton bring the family members to him who were waiting for Mongar at the clinic. In the meantime, paramedics and firemen arrived and eventually transported Mongar to the hospital where Mongar was pronounced dead. Hampton indicated that after the emergency responders left, Gosnell went back to work and completed several more abortions. The next day, things returned to business as usual. Gosnell ordered that the clinic be cleaned top to bottom after Mongar’s death and had Hampton’s common-law husband, Jimmy Johnson, paint all the walls on the first floor. Later, in February, 2010, Gosnell’s clinic was raided by the FBI and DEA, who segregated all the employees and interviewed them. Hampton admitted she had lied to the agents during her interview. The next day, the clinic opened as usual. Several patients were at the clinic when the police came with the order for them to close. After that, Gosnell again ordered the clinic to be cleaned and painted while he had some of the furnishings replaced. Later, Hampton was arrested and charged with perjury for lying to the Grand Jury that later issued indictments against Gosnell and eight of his employees. She entered into a plea agreement that would have the potential to reduce her expected 15-year sentence in exchange for her cooperation and honest testimony against Gosnell. A disagreement broke out between prosecutors and defense attorney Jack McMahon over exactly what Hampton lied about. Judge Jeffery P. Minehart dismissed the jury for the day then rebuked the attorneys for not reaching agreements about such disputes prior to coming to court. Earlier in the day, Crime Scene Unit officer John Taggart was cross examined by McMahon about the condition of the clinic and the furnishings. Taggart admitted that he had never tested any of what he thought were blood smears and stains found throughout the clinic to prove the substance was in fact blood. He explained that at a normal crime scene, blood would be tested to determine if it belonged to the victim or the perpetrator. In the Gosnell case, there had been no need to determine who the blood belonged to, so it was not tested. Cameron then asked Taggart to test the apparent blood stains on the equipment in the courtroom, including smears on a dirty gray recliner seized from the clinic’s recovery room. Taggart agreed to do the tests, but has yet to testify as to the results. McMahon attempted to portray the clinic as neat, clean, and sterile, using the fact that many women were return abortion customers as an indication that the clinic was in good shape. However, Cameron asked the judge to allow him to bring in testimony of “prior bad acts” that have thus far been kept from the jury in order to counter McMahon’s claims. No ruling was made on that request. So many aspects of Gosnell’s abortion operation have been seen in abortion clinics across the nation. For example, Operation Rescue discovered a garbage disposal in a sink room at the Wichita abortion clinic it bought and closed in 2006 that was also used to dispose of the contents of the suction machine bottles. In a Muskegon, Michigan, abortion clinic, filthy conditions and out-of-date medications were discovered earlier this year that were very similar to those at Gosnell’s “House of Horrors.” While the practices described by the witnesses are shocking, they become even more so when one realizes that nearly every abortion clinic in America duplicates — at least in part — many of the same deficiencies found at Gosnell’s clinic. Testimony will resume at 9:30 a.m. on Thursday morning when a witness is due to be brought in from jail to testify. That witness was not named. The trial is expected to last another 3-5 weeks.